Lipco Aerospace Ltd: The continuing technical progress within the field of metrology has resulted in many traditional measuring instruments being superseded by the emergence of more advanced modern systems. A major exception is the optical profile projector, although this ubiquitous device has been a preferred means of measurement for many decades, the accuracy and reliability of the method continues to ensure its popularity. Even though their outward appearance has changed minimally over the years, the use of the advanced technology employed in today’s optical profile projectors has resulted in their impressive technical evolution and enduring popularity. Boasting 80 years within the field of Metrology, Baty International remains a global leader within the field of advanced optical profile projector technology, indeed such is the standing of the company, its well known ‘Shadowgraph’ brand is used globally as a generic term for an optical profile projector. Illustrating the continuing popularity of Baty’s range of advanced optical profile projectors is the recent sale to Lipco Aerospace Ltd.
Based in Wimborne, Dorset, Lipco Aerospace Ltd provides a highly skilled precision design, engineering and production service to the global Aerospace sector. The well known company’s comprehensive manufacturing resources include cutting edge, 3, 4 and 5 axis CNC milling as well as advanced CNC turning and grinding resources. Lipco also provides a wide range of welding, assembly and test services in addition to modern CAD facilities and sophisticated off-line programming systems. Accredited to AS9100 and ISO 9001:2008, Lipco Aerospace administers a complete Quality Management System in accordance with BS EN ISO 9002. To ensure the continuity of its excellent reputation for the delivery of high quality components, Lipco Aerospace employs a range of advanced metrology equipment including several Coordinate Measuring Machines. Recently, when the company was faced with a large increase in demand for its output, and the potential for bottle necks in its busy inspection department occurred, rather than purchase a further expensive CMM, the available, cost effective optical profile projector options were considered. Lipco Aerospace Quality Manager, Bob Cox explained “When recently challenged with an increasing inspection work load, we looked at possible ways of easing the growing demands on our CMMs and removing any potential delays in our Inspection Department. As modern optical profile projectors are able to meet our required accuracy standards, and given their speed and ease of use, we decided that this was the ideal technology for our needs. “Having considered the alternatives, we purchased an R14 GXL model from Baty International. 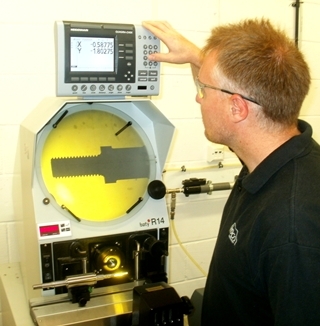 Now installed, the advanced Baty projector’s 175mm measuring capacity and high accuracy specification means that it is now used to inspect many of the critical parts previously allocated to our CMMs. The R14’s logical operating system enabled our operators to quickly master its use; in addition we have been delighted with its excellent speed of use and accuracy. Available in a range of variants, Baty’s robust R14 bench-mounted profile projector range is able to deliver class-leading precision when used in dedicated inspection departments or on the shop floor. Enabling the inspection of a wide range of components, the popular range combines high accuracy non-contact measurement with a generous measuring range. Standard R14 features include a 340mm (14") screen with 90° crosslines and chart clips, profile illumination with a halogen lamp and a green filter, a robust workstage with a measuring range of 175mm (7") x 100mm (4") and digital angle measurement to 1 minute. High quality fibre optic surface illumination is a standard feature, whilst a ± 7° helix adjustment of the R14’s light source is provided to allow accurate thread form projection. To meet the specific needs of all potential users, Baty’s R14 range is available in three specifications. The entry level XLS provides simple 2 axis digital readout for X&Y measurement. The GXL variant incorporates geometric functions for skew alignment, angle radii measurement; pitch circle diameter and construction of intersect points. Whilst the GXL-E offers all of the GXL’s features with the addition of a screen mounted automatic profile edge sensor. Baty’s Fusion 2, PC based measuring system has full geometric functionality allowing graphical views of measured parts to be printed as fully dimensioned drawings. The easy to use software’s reporting capability includes the generation of tabulated details with pass / fails analysis, auto-link to Excel™ and an auto sequence programming feature. For more information on Baty's R14 Profile Projector click here.